No more stones for me! Your feline friend may "speak" to you, but he cannot tell you about a common health risk he faces. Cats often form struvite crystals in their urine that can grow to create a medical emergency. With your veterinarian's help, you can dissolve struvite crystals and prevent recurrence of the problem. Take your feline pal to his veterinarian. She will test your kitty's urine and may X-ray his bladder to determine if he has struvite stones. Struvite crystals commonly form in a kitty's urine, and their presence does not necessarily indicate a problem. When crystals precipitate in the urethra or bladder, a stone can form. Struvite stones can usually be treated, but sometimes stones need to be surgically removed if they block urine flow. Feed the diet your veterinarian prescribes. This diet is formulated to dissolve struvite stones quickly. Your feasting feline won't notice that his food is limited in phosphorus and magnesium, which both contribute to the formation of struvite crystals. The prescribed food will also reduce the acidity of Kitty's urine to dissolve the stone. Follow your veterinarian's feeding instructions for optimal results. Provide fresh water for your cat at all times. He needs a full and flushing bladder to dilute any crystal concentrations. Cats in the wild generally would get all the water they need from the prey they eat, so they are not genetically wired with a keen thirst response or to lap water from bowls. In your household, Kitty's most natural water sources are limited, so canned wet food supplemented with plenty of available fresh water is best for prevention and treatment. Change the litter often. 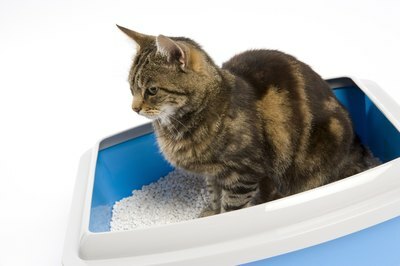 Because you're doing everything you can to ensure Kitty is consuming more water, you should expect to see more urine in his litter box. Your finicky friend prefers his box to be clean and dry. By changing the litter frequently, you will help persuade him to use the litter box instead of seeking other places in the house to urinate. Your cat is a creature of habit, so it's best to avoid changing his brand of litter. Follow up with your veterinarian on schedule. Followup X-rays and exams are the only way to confirm the struvite is being dissolved. Followups are an essential part of treatment. Based in Chicago, Jennifer Lutz has extensive experience in the veterinary field including writing, editing, consulting, education, sales and clinical work. Her articles have appeared in "Chicago Tails Media," The Nest Pets and Webvet. She has a Bachelor of Science in zoology from Michigan State University, and certification in medical writing and editing from the University of Chicago.